Multiple myeloma is a clonally diverse disease, with multiple clones present at diagnosis. 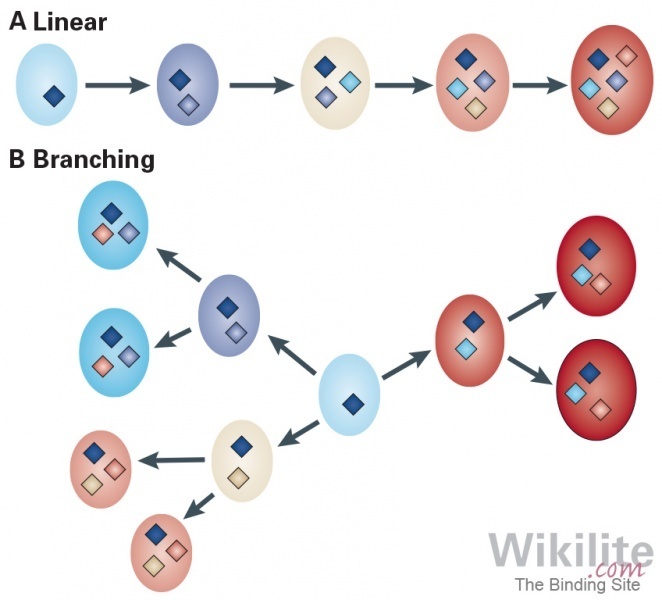 Clones may express intact immunoglobulin, free light chains, both, or rarely, neither. Changes in clonal dominance may be reflected by changes in monoclonal immunoglobulin production. Free light chain escape is an example of clonal evolution, first characterised over 40 years ago. Figure 19.1. (A) Linear and (B) branching transformation of MGUS to MM. Genetic events conferring a selective advantage are shown as diamonds. (Reprinted by permission from Macmillan Publishers Ltd: Nature Reviews Cancer , copyright 2012). Monoclonal gammopathy of undetermined significance (MGUS; Chapter 13) and smouldering multiple myeloma (SMM; Chapter 14) are asymptomatic plasma cell dyscrasias, with a propensity to progress to symptomatic multiple myeloma (MM). Genetic analysis has demonstrated that the pre-malignant conditions share some of the mutations associated with MM, and that multiple genetic "hits" are required for the progression to symptomatic disease . Such mutations may be acquired in a linear fashion (Figure 19.1A), and others through branching, non-linear pathways (Figure 19.1B) . Sequencing studies have shown that at MM presentation, the median number of exonic mutations is approximately 60, but this varies greatly between individuals from 10 to more than 500 . During the evolution of MM, tumour clones may acquire further genetic abnormalities, e.g. to allow them to further expand or compete for stromal niches within the bone marrow, such that within an individual patient, multiple genetically distinct clones may be present. Furthermore, the clonal composition changes during the course of the disease, giving rise to “tides” of myelomic clones which compete for dominance in a landscape that is continually changed by therapy . In this chapter we review the current understanding of myeloma clonal evolution and discuss the importance of monoclonal protein measurements in surveying these changes.